A couple of weekends ago I was staying in Dorset where I heard about Wyndham’s Oak, an ancient tree I felt compelled to seek out. It is a pedunculate Oak (Quercus robur) and it is ancient, maybe 1000 years old. It is a shrinking hulk in an unlikely setting but it is a local landmark and has been for centuries. Also known as the Silton Oak, it can be found in the Dorset village of the same name. Now it stands discreetly in a meadow by the river Stour behind St. Nicholas’ parish church. It is not visible for miles around and no road runs close by, yet it is marked on the Ordnance Survey map. Called Wyndham’s Oak after Sir Hugh Wyndham, an obscure 17th century judge and local worthy who managed to keep a low enough profile to ensure his public service career spanned the rules of Charles I, Oliver Cromwell’s interregnum and Charles II. According to the story, Sir Hugh did nothing more than sit in the shade of this great tree – undoubtedly a magnificent sight at the time – forever linking his name to the tree at the apex of its height, spread and girth. At the time of the English restoration then, this tree was perhaps 600 years old. It may have been hollow as it is now, but it almost certainly would have been considerably larger than today’s enormous bole surmounted by little more than a toupé of branches. 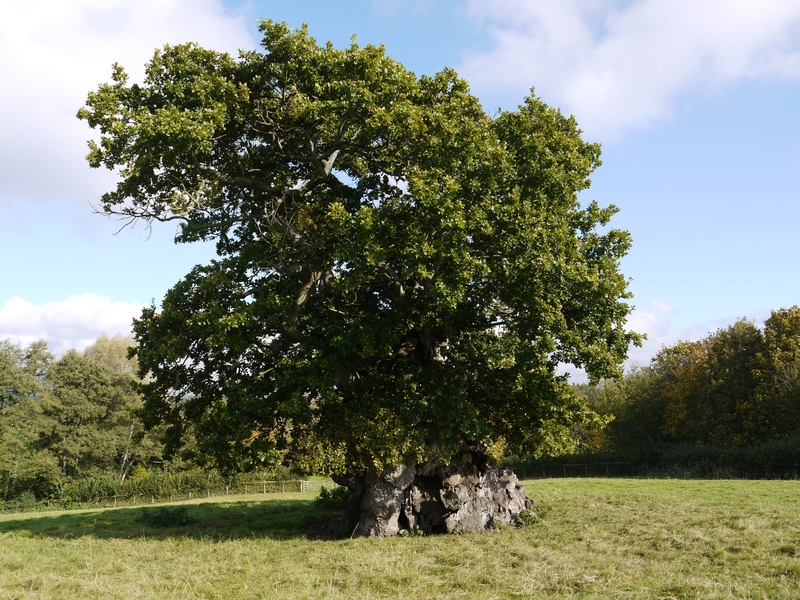 Possibly planted as a boundary marker of the Gillingham Forest, a royal deer hunting chase favoured by King John, Wyndham’s Oak survived the forest’s destruction during Charles I’s reign adding further weight to the notion that it was so remarkable that it was intentionally saved from the sawyers supplying the needs of the King’s fleet. 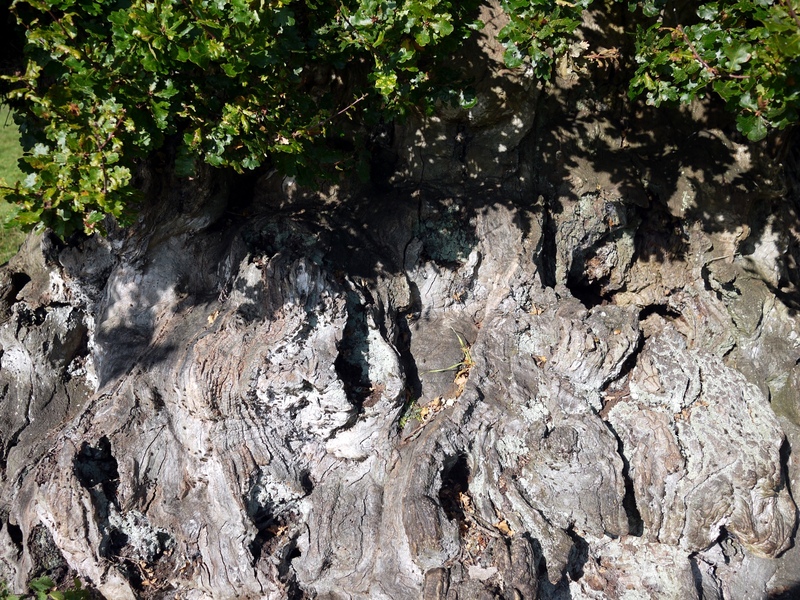 The UK is Europe’s hotspot when it comes to aged timber – Richmond Park in west London supports ‘more 500-year-old trees than France and Germany combined’ – Wyndham’s oak is one of the most enduring of Britain’s many remarkable trees. There is no obvious reason why there are so many ancient trees in this country, but perhaps the feudal system allowed trees to grow old in aristocratic deer parks unmolested by fuel hungry peasants, or perhaps Britain got off lightly from the ravages of wars that brought in their wake pressing need for fuel and shelter to large parts of the continent. Ultimately though these survivors are testament to the great fondness we great apes have for trees. Have just visited Wyndham Oak myself and found your blog whilst looking to see what else I could find out about it. I took a couple photos inside and out which are on my blog if you’re interested.